Yeah, you know, I'll be back, Hasta La Vista Baby... Eeeeeeeh. "Within the reality of one specific fiction, how do other fictions exist?" A Celebrity Paradox describes the complications that arise from creating a fictional universe in which that fictional universe does not exist, and the actors playing roles within it do not exist either. So, in Terminator, Arnold Schwarzenegger doesn't exist and is not the governor of California. There's no Guvernator. Or, in the world of Batman Begins, the Batman comics never existed, and neither did Christian Bale. In modern updates of a work, the original may be unheard of. Writers get a li'l kick out of toying around with the concept, such as having the character meet the actor/actress playing them or giving a Shout-Out to the original source. Cameos of famous actors or artists may either be in the form of Recursive Canon or Richard Nixon the Used Car Salesman. This avoids such awkward issues as why the plucky hero isn't constantly asked for autographs. It can become extremely awkward when the show is set amongst the showbiz industry, and the stars and writers become famous enough to be on the scene where the show finds itself. Also, if a larger-than-life celebrity were chosen to play a nerd, a geek, or a loser (for example, Hilary Duff in A Cinderella Story), that would also be extremely awkward. To what extent this is done is a subject for discussions amongst fans. Do the actors themselves not exist? Do other works the actors have appeared in exist? If they do, who starred in them? You can also scale this out to the point of total absurdity by combining it with Six Degrees of Kevin Bacon; for example, if The Good Place were to mention the existence of The Muppet Show in-universe, then would it become a problem that Jason Segel wrote and appeared in The Muppets three years after acting alongside Kristen Bell in Forgetting Sarah Marshall, and does the show have to avoid making references to Facebook just because Jesse Eisenberg played Mark Zuckerberg in The Social Network before appearing in Now You See Me with Woody Harrelson, who first became famous for starring in Cheers alongside an actor who looks exactly like Michael? Many a show or movie trying to be hyper-realistic does its best to distill this concept to an extent by refusing to cast a Celebrity Star because they're not obscure enough and would be too recognizable, as it strains Willing Suspension of Disbelief. Of course, if the star becomes famous because of said work, the same issues could still pop up. Note that, in Animated Series and Anime, the Celebrity Paradox wouldn't be as big of an issue. After all, in this type of medium, the characters wouldn't necessarily resemble the actors who do the voices of them. Additionally, the paradox may be avoided if the work is a Period Piece set before the actors were famous. So, for example, no one in Raiders of the Lost Ark can wonder why Indy looks exactly like Harrison Ford because the film is set before Harrison Ford was even born. Perhaps, the paradox may also be avoided in works that take place in the far future — when the actors are likely to be forgotten. And it's avoided completely in Constructed World fiction, of course. Some animations actually even consciously play with this trope with Talking to Himself by having the actor voice themselves...and someone else (for total Refuge in Audacity, they even point the celebrity out themselves). Certain Setting Updates can face a similar problem: they have to be set in a world where no one will recognize the name of Sherlock Holmes, Superman, or Macbeth, or the tropes that they've since made popular, but are otherwise culturally identical to the real world. Again, it's best to just not think about it. In truth, every film or TV series that stays even partially grounded in the contemporary world is inherently affected to some extent by this paradox, because you can always raise the question of whether the show, the film, its actors or those actors' prior roles still exist inside the work's own internal reality — the only way it can ever be truly avoided is by writing an entirely fictional universe which never, ever acknowledges the existence of anything or anyone from, and doesn't even pretend to bear any resemblance to, the real world at all. Don't overthink it, just accept the simplest answer: things went the same way, but in place of the actor or show that could not exist, it was a very similar actor or show. Jeri Ryan probably moved to Hollywood because she got cast in Battlestar Pegasus: The Geminon Years. Nobody in Fringe notices that William Bell looks just like Mr. Spock because, in their universe(s), Spock was played by Christopher Lee. And so on. But also, accept that it's usually not important to devote any serious attention to this "problem". Films or TV shows do sometimes choose to intentionally play with the paradox, however. 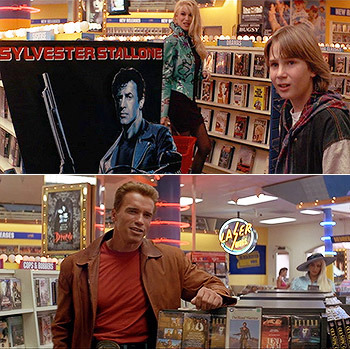 This actually appears in Last Action Hero, as the image above shows: movies that starred Arnold Schwarzenegger in our universe still exist inside the film's universe, but starring Sylvester Stallone instead. Playing with this is a form of Post-Modernism. Actor Allusion can be a form of playing with this. Contrast Your Costume Needs Work and compare Recursive Canon, see also Different World, Different Movies. Of course, in real life, there are plenty of people who closely resemble celebrities and go about their business without being mistaken for them very often. Maybe we're all in a movie!